Andriy Pototskyi’s palace was built of bricks and stones on the territory of the Stanislaviv fortress. It was reconstructed. This castle is one of a few fortress buildings that remain until now.The entrance gate is decorated with armor and other military installations. It is surrounded by a high brick wall and the fragments of the fortification shafting and bastions. 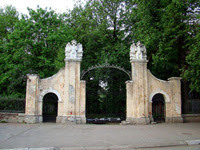 There is a three-storey building, the remains of the palace, to the left of the gate in the middle of the park (architect F.Karassini).Two wings in Baroque taste situated to the left and to the right of the gate are also worthy of attention. They have been left with almost no changes since the 18th century. As a result of thoughtless financial operations of the last owner A.Pototskyi the palace was taken to the Austrian Treasury in 1801. At the beginning of the 19th century its inside design was changed because the palace became a military hospital. It existed 200 years. The military hospital was closed in 2004. The creation of museum and tourist complex in the palace is under consideration now. Polish king Yan Sobeskyi and Austrian Emperor Yosyf II visited the palace.The wife of Pylyp Orlyk (he was a Ukrainian hetman after Ivan Mazepa) lived here 30 years.